Lately I feel like I've reached the point in my career where I can begin to offer advice to those who are just getting started. I met with a young man last week to discuss his interest in marketing, and offer a critique of his resume. He seemed to be very uncertain about the experience that he already had (2 years, if you added up his 1 year of internships plus 1-year of work experience). Plus he didn't know how to position himself on his resume, so he fell into the trap of including EVERYTHING in hopes that something would jump out at me. It was crammed so full of info, that I couldn't make sense of it. He had been told not to extend his resume long than 1 page, so reduced his point size to make it all fit. Ugh. After a 45-minute discussion, I learned (and helped him to see) some of his strengths, and I offered numerous suggestions on how he could improve his resume. It was an interesting exercise for me, sitting across the table. Being a teacher helps you to see what you already know. I'm eager to see how he changes his resume, if at all. I was discussing with one of my colleagues yesterday why some people complain about politics, but they don't vote. We both agreed that if you don't vote, your opinion doesn't count. If you're mad about something, do something about it. If you support something and can make a change, you owe it to yourself to try to change it. I'm going up to CMU (Central Michigan University) tomorrow for an alumni luncheon. Haven't been there in years and I believe I have enough knowledge on work now to start passing the wisdom on. I'm curious what kinds of students will be joining me at my table. I remember myself in college, and not really caring about alumni. Then after the lunch, I'm trying to schedule a meeting with my Senator (or rather, one of her staff members) to discuss legislation with the senate on Fair Pay. I can't believe it happens (pay discrimination) and I know I can help to do something about it. I'm using my "voice" to drop off a petition containing thousands of signatures (or e-signatures, as it may be). 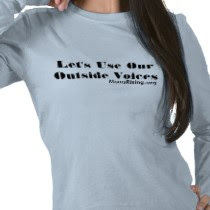 Check out www.momsrising.org to learn more about this great organization. I have to get one of their t-shirts. Over the past year, I've been thinking about why we don't see a lot more women in management positions. Is there really a glass ceiling? Or, are we holding ourselves back? Based on what I'm seeing, I think we're more to blame. That's not to say that society doesn't play a part. I see stereotypes played out every day, but when we push back against those stereotypes, we can make things change. I'm working full-time and a mom (I won't use the term "Working Mom" unless everyone starts to refer to our spouses as "Working Dad." More on this later in another blog...). I'd love to hear your stories, too. 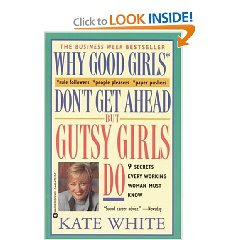 I'm reading a great book right now..called Why Good Girls Don't Get Ahead, but Gutsy Girls Do. I'm adding it to my must read list.